Vinyl Anchor Desk Chair Mats - Office Chair Mats | Mats Inc.
Our anchor mat sits still, even if you don't. Mat has hundreds of rigid anchors that hold the mat in place. The textured surface facilitates easy but controlled movement of caster chairs. 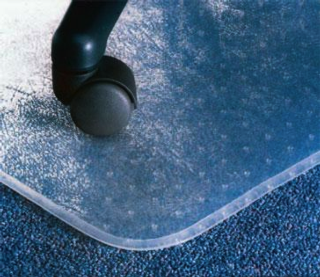 The vinyl material is scuff-resistant and is transparent to let the beauty of your carpet show through. Available in 3/16" and 1/4" thickness. 3/16" material is available in rolls up to 50' in length.